Meet Hung Hsin-chieh, a “plant hunter” in Taiwan. Plant hunters travel around Taiwan looking for plants that are on the brink of extinction and bring them back for cultivation. Walking in the woods and climbing up trees, Hung Hsin-chieh said that the job of a plant hunter is probably the most dangerous profession in Taiwan. He often thinks he might die in the forest. Hung jumps from tree to tree, climbs the mountains and goes down to the sea just to look for endangered species of plants. He then brings them back to a botany research center for cultivation. He might be chased by hornets or fall from trees, but those incidents never dampened his passion for his job. 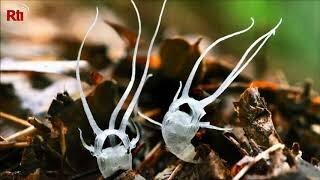 If it weren’t for his love for the job, we wouldn’t be able to learn about Thismia Taiwanensis, a white translucent plant with tentacles coming out of the top, or about a flowering plant of the orchid family that can only be found on Xiaolanyu, a small island off the southeastern coast of Taiwan. Hung is often praised by his colleagues for his dedication to his challenging and unique work.